Not many people are talking about it, but “Strikeforce: Rockhold vs. Jardine” is in fact going down this Saturday in Las Vegas. To help generate some hoopla for the show, the organization hosted a press conference Thursday featuring the card’s featured fighters. 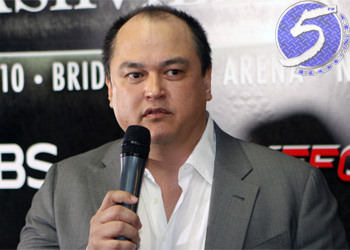 Strikeforce CEO Scott Coker (Pictured), Luke Rockhold, Keith Jardine, Muhammed “King Mo” Lawal, Lorenz Larkin, Adlan Amagov and Robbie Lawler were all at the podium. Rockhold makes his first middleweight title defense when he meets Jardine in the night’s main event. The Joint at Hard Rock Hotel & Casino in Nevada hosts Saturday’s festivities. Showtime will broadcast the card’s main bouts at 10PM ET/PT.